Cocaine is a stimulant drug harvested from the coca plant most often found in South America and particularly in Columbia. Most of the nation’s cocaine enters the country through the Southwest Border (SWB), which contains parts of California, Arizona, Texas, and New Mexico. In the 2014 fiscal year (FY), 4,443 pounds of the 4,554 pounds of cocaine seized were in the SWB sector, and 1,697 pounds were seized in San Diego alone, which was the highest amount of any American city. Cocaine is abused in powder or rock form called crack, and it may be snorted, smoked, injected, or ingested for a quick and powerful high. Cocaine raises heart rate, body temperature, respiration levels, and blood pressure while decreasing pain sensations and the need for sleep, and increasing energy and focus levels. It is considered a Schedule II drug in the United States, meaning that it may have a few rare medicinal uses but is largely considered an illegal drug with a high potential for abuse and dependency. Cocaine abuse has been slowly declining across California in the past several years, although the drug still poses a threat to an individual’s personal physical and mental health. Cocaine use is also linked to increased crime rates and overall costs to society. Cocaine may prevent some of the chemical messengers in the brain responsible for pleasure, like dopamine, from being recycled, thus creating a flood of these neurotransmitters and resulting in euphoria. Cocaine highs may be intense but also short-lived; thus, many people who abuse cocaine do so in a binge pattern, taking multiple doses back to back to prolong or increase the high. This can lead to the brain becoming dependent on the drug, and an addiction may form that is both physical and psychological in nature. Individuals regularly abusing cocaine may no longer be able to feel pleasure without the drug and may feel anxious, depressed, restless, and irritable when not under the influence of cocaine. Cocaine withdrawal may be emotionally intense and may be best treated with medical detox where individuals are kept safe and withdrawal symptoms may be managed with medications and therapeutic methods. Cocaine addiction may cause many negative health, economic, social, interpersonal, and legal ramifications. Repeated cocaine abuse may damage the cardiovascular, respiratory, and gastrointestinal regions of the body and may increase the risk for heart attack, stroke, the contraction of infectious diseases through the sharing of dirty needles, damage to the nasal cavities from snorting the drug, scarring and vein damage at injection sites, and more. In 2012, injection drug use (IDU) was considered to be the cause of more than 8,000 HIV/AIDS cases in California. Cocaine abuse may result in overdose when breathing, heart rate, temperature, and blood pressure are raised to dangerous levels and may cause a life-threatening stroke or heart attack. Between January and April 7, 2014, cocaine abuse was the cause of 1.4 percent of all calls to poison control centers in Los Angeles County and was present in 11.9 percent of LA County coroner’s toxicology reports. Cocaine also accounted for 7.2 per 100,000 population visits to emergency departments (EDs) in 2012 in Los Angeles County. Drug abuse and dependency are major drains on the economy and have significant costs to society as a whole. Illicit drugs, which includes cocaine, are thought to cost society overall close to $200 billion annually, as individuals abusing or dependent on these drugs may need more healthcare, be less productive at work, and may be more likely to involved in crimes or incur legal or criminal justice expenses. Domestic violence, property crimes, sexual assault, and other offenses may be more common when someone is addicted to or under the influence of drugs. In California in 2009, there were 113,000 adult felony drug arrests, and 38 percent of them were for narcotic drugs such as cocaine. 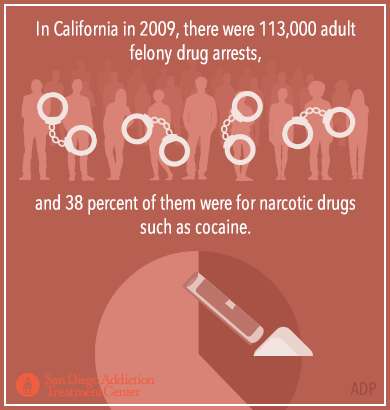 In 2010, there were more than 30,000 people in California Department of Corrections and Rehabilitation (CDCR) system for drug-related felonies. These numbers may not include the crimes that may be committed in the attempt to score more drugs, or while impaired by drugs, or crimes that may be committed due to drug addiction. Cocaine has been historically linked to increased violence and violent crimes. In 2007, almost 4 percent of all homicides in the United States were considered drug-related. In California in 2013, close to a quarter of prison inmates tested positive for drugs and 2 percent of those were positive for cocaine. In California, there are 202 drug courts operating to provide nonviolent offenders with an alternative to prison and access to treatment for individuals abusing or dependent on substances like cocaine. There are adult drug courts, juvenile ones, and family drug courts, all with the intention of helping people get the care they may need to recover, instead of just locking them up in prison. The drug court system may provide initial assessments and referrals to treatment programs and provides an important link to public treatment programs in an attempt to prevent future crimes. In addition to legal or criminal justice concerns, cocaine addiction may also create problems within families and cause financial strain as individuals struggling with addiction may find it difficult to maintain employment. In addition, money may be spent on drugs instead of necessities. Children may be neglected as the result of drug abuse or addiction as well. Cocaine addiction affects all aspects of a person’s life, but treatment can really help turn things around. Even though there is no real chemical difference between crack cocaine and powdered cocaine, they have been treated differently in this country for years. Many would argue that this is the result of racial profiling, as extreme crack cocaine laws seemed to target underprivileged minorities and especially African American citizens. In the 1980s, as many as 80 percent of those incarcerated in America for crack cocaine-related offenses were African American. Possession of just 5 grams of a “rock” of crack cocaine would land an individual five years in prison; in contrast, it would take 100 times more powder cocaine for the same punishment. These laws are starting to be overturned and recognized as potentially discriminatory. In 2014, California passed the California Fair Sentencing Act in an attempt to reverse the sentencing disparity. Prior the passage of the law, some 98 percent of individuals sent to prison in California for the possession of crack cocaine for sale were people of color. Addiction can be successfully treated in a variety of settings and through a range of methods. In general, there are two main treatment types:- private, or fee-for service, and public treatment programs that are paid for through state and county resources. In California, public options are run through individual county offices. Public programs serve the population as a whole and provide treatment options for free or low-cost for individuals who need it. In California, the California Department of Health Care Services (DHCS) Substance Use Disorder (SUD) Services Division develops and supports addiction prevention, treatment, and recovery programs within the state. As a general rule, individuals may first visit their primary care physician for a referral to a public and county-run SUD program. Private programs may not need an initial referral. Private programs may accept most insurance plans and typically offer flexible funding plans as well. Almost 1 million Californians aged 12 and older each year between 2009 and 2013 were considered to be suffering from drug dependence or abuse, and only 12.6 percent of those needing treatment actually got the services they needed in a public treatment program. Private treatment programs may serve to help bridge this gap. Both private and public treatment providers may offer a range of services depending on what an individual may need. Unique populations like pregnant women, children, and the elderly may benefit from a specialty program, for example. People who have abused cocaine for a long time, or who may be abusing multiple substances at a time, may be more dependent on the drug and may benefit from a more structured or stringent program, such as intensive outpatient treatment or residential treatment. Outpatient treatment models may be best suited for individuals with involved support systems at home since they will return home each night. Residential treatment may be the most comprehensive option and can provide the chance to build a strong base before returning back home. Both of these programs may start with a medical detox program first to help a person become physically stable. There is no FDA-approved drug to treat cocaine addiction at this point; however, several drugs have been promising and may be used off-label during detox, treatment, and recovery. In general, treatment for cocaine addiction is likely to include both pharmacological and behavioral methods. Beyond the treatment window itself, many organizations and programs may provide education, prevention, and recovery services. Support groups and transitional programs can help foster recovery by helping to close the gap between treatment and sustained recovery and provide ongoing services. 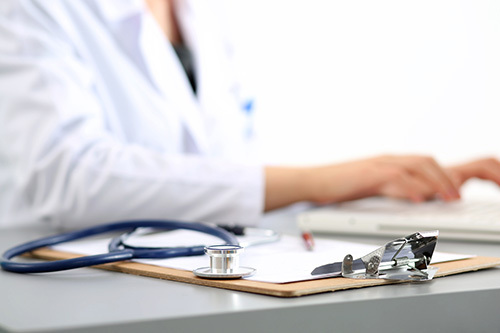 Substance abuse treatment or recovery facilities providing nonmedical care in California must be licensed or certified through the DHCS, and a list of service providers can be found here. Public treatment in California for substance abuse and addiction is provided by individual counties, and the County Directory keeps a current list. Individuals who are recipients of California’s Medicare program, called Medi-Cal, may find information on treatment and services via the Drug Medi-Cal (DMC) Division of DHCS. The Substance Abuse and Mental Health Services Administration (SAMHSA) is a national federal organization that provides a Behavioral Services Locator Tool to help individuals battling substance abuse and/or mental health issues find local service providers. The National Alliance on Mental Illness (NAMI) California is a mental health services resource for families and individuals with information on local and regional affiliates. A recovery peer support group, Cocaine Anonymous has regional locations for meetings and a list of localized resources on their website. Each individual California county will have local and community resources available as well as local private and public treatment options for cocaine abuse, addiction, and mental health concerns. (Nov. 2014). “2014 National Drug Threat Assessment Summary.” Drug Enforcement Administration (DEA). Accessed December 1, 2015. (n.d.) “Drug Fact Sheet Cocaine.” Drug Enforcement Administration (DEA). Accessed December 1, 2015. (n.d.). “California Drug Control Update.” Office of National Drug Control Policy (ONDC). Accessed December 1, 2015. (Feb. 2014). “Drug Abuse Patterns and Trends in the San Francisco Bay Area- Update: January 2014.” National Institute on Drug Abuse (NIDA). Accessed December 1, 2015. (Feb. 2014). “Drug Abuse Patterns and Trends in San Diego County- Update: January 2014.” National Institute on Drug Abuse (NIDA). Accessed December 1, 2015. (Feb. 2014). “Drug Abuse Patterns and Trends in Los Angeles County- Update: January 2014.” National Institute on Drug Abuse (NIDA). Accessed December 1, 2015. (n.d.). 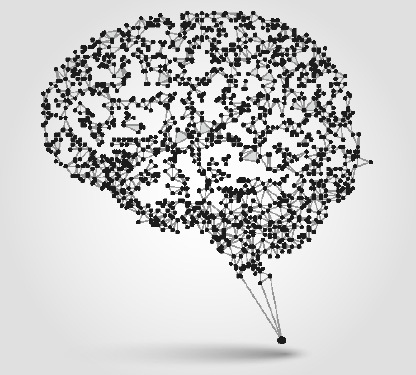 “Dual Diagnosis.” National Alliance on Mental Illness (NAMI). Accessed December 1, 2015. (2012). “HIV/AIDS Living Cases, 2012.” California Department of Public Health. Accessed December 1, 2015. Brecht, M. Ph.D. (June 2014). “Patterns and Trends in Drug Abuse in Los Angeles County, California: 2013.” National Institute on Drug Abuse (NIDA). Accessed December 1, 2015. (Aug. 2015). “Trends and Statistics.” National Institute on Drug Abuse (NIDA). Accessed December 1, 2015. (n.d.) “Indicators of Alcohol and Drug Abuse FY 2010-11.” California Department of Alcohol and Drug Programs (ADP). Accessed December 1, 2015. (n.d.). “Drugs and Crime Facts.” Bureau of Justice Statistics. Accessed December 1, 2015. (April 2014). “California Prisons Found 1 in 4 Inmates Used Drugs.” CBS Los Angeles. Accessed December 1, 2015. (June 2013). “Drug Court Locations in the United States as of June 2013.” National Institute of Justice(NIJ). Accessed December 1, 2015. Speri, A. (Oct. 2014). “California Has Finally Recognized That Crack and Cocaine are the Same Thing.” Vice News. Accessed December 1, 2015. (Sept. 2014). “Governor Signs Historic California Fair Sentencing Act.” American Civil Liberties Union (ACLU) of Northern California. Accessed December 1, 2015. (2015). “Substance Use Disorder Services- Alcohol and Other Drugs Programs.” California Department of Health Care Services (DHCS). Accessed December 1, 2015. (2015). “Behavioral Health Barometer, California 2014.” Substance Abuse and Mental Health Services Administration (SAMHSA). Accessed December 1, 2015. (Sept. 2010). “Cocaine.” National Institute on Drug Abuse (NIDA). Accessed December 1, 2015. (July 2015). “Department of Health Care Services Licensing and Certification Section Status Report.” California Department of Health Care Services (DHCS). Accessed December 1, 2015. (2015). “Alcohol and Other Drugs Programs County Directory.” California Department of Health Care Services (DHCS). Accessed December 1, 2015. (2015). “Drug Medi-Cal (DMC) Treatment Program.” California Department of Health Care Services (DHCS). Accessed December 1, 2015. (n.d.). “Behavioral Health Treatment Locator.” Substance Abuse and Mental Health Services Administration (SAMHSA). Accessed December 1, 2015. (2011). “NAMI California Mission.” NAMI California. Accessed December 1, 2015. (2010).”Cocaine Anonymous (C.A. ).” Cocaine Anonymous (C.A.). Accessed December 1, 2015.